JOAN JETT & THE BLACKHEARTS: Joan Jett is an originator, an innovator, and a visionary. As the leader of the hard-rocking BLACKHEARTS, with whom she has become a Rock And Roll Hall Of Fame inductee, she's had eight platinum and gold albums and nine Top 40 singles, including the classics "Bad Reputation", "I Love Rock 'N' Roll", "I Hate Myself For Loving You" and "Crimson And Clover". Her independent record label, Blackheart, was founded in 1980 after she was rejected by no less than 23 labels. Blackheart is one of the longest running indie labels and continues to give voice to new bands. As a producer, she has overseen albums by BIKINI KILL, CIRCUS LUPUS, as well as THE GERMS' L.A. punk masterpiece "GI". Jett's music has become a permanent force in mainstream culture. 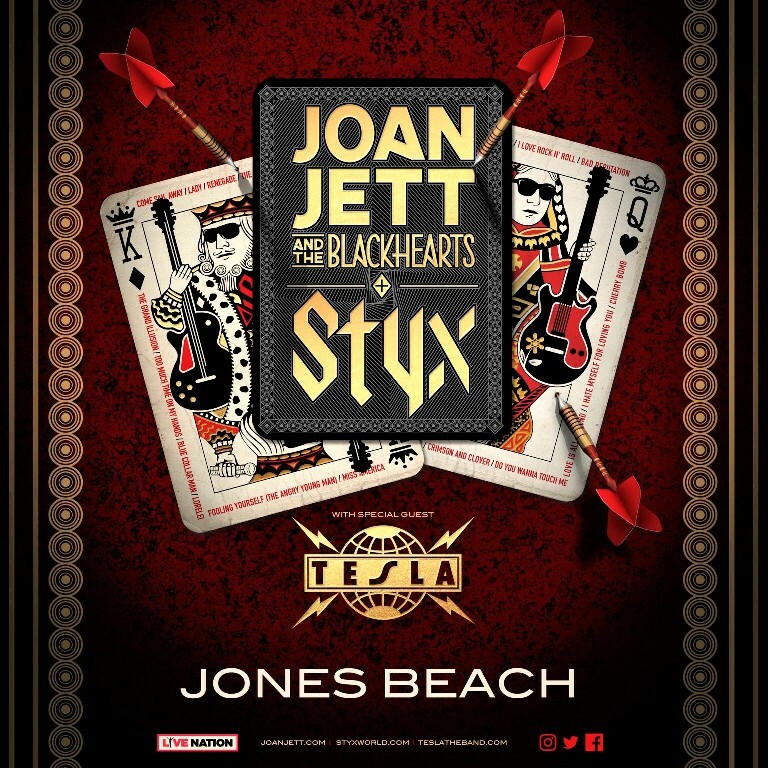 Jett and THE BLACKHEARTS released their latest record, "Unvarnished", in 2013 and continue touring the globe with headline shows alongside fellow rock icons like THE WHO, GREEN DAY and the FOO FIGHTERS. Additionally, Jett has acted and appeared in movies and television, including the film "Light Of Day". Jett was also able to see her story told in "The Runaways", the film based on (lead singer of THE RUNAWAYS) Cherie Currie's book "Neon Angel", starring Kristen Stewart as Jett, and Dakota Fanning as Currie. Jett was close to the project, serving as executive producer. In January, the documentary film based on Jett's life, "Bad Reputation" — produced by Blackheart's SVP Carianne Brinkman and directed by Kevin Kerslake — premiered to critical acclaim at the 2018 Sundance Film Festival, with the New York Post hailing that "'Bad Reputation' does it right, tracing Jett's trailblazing path as one of the first, and still the hardest-rocking, women." STYX: Tommy Shaw (vocals, guitars), James "JY" Young (vocals, guitars), Lawrence Gowan (vocals, keyboards), Todd Sucherman (drums) and Ricky Phillips (bass), along with the occasional surprise appearance by original bassist Chuck Panozzo — would eventually transform into the virtual arena rock prototype by the late '70s and early '80s, due to a fondness for big rockers and soaring power ballads. Over the course of their 40-year career, they've released 15 studio albums, six best-of compilations and four live albums, garnering eight Top Ten singles. STYX has sold over 30 million albums worldwide. Throughout their illustrious career, they've performed more live shows since 1999 than all of the previous years of its career combined. Two Super Bowl appearances, Pollstar box office chart-topping tours with DEF LEPPARD, JOURNEY, BOSTON and BAD COMPANY (to name only a few), two more studio albums. September 2, 2016 marked the long-awaited release date of "Styx: Live At The Orleans Arena Las Vegas" on DVD, Blu-ray and digital formats via Eagle Rock Entertainment. It captures the band performing in July 2014 such fan favorites as "Too Much Time On My Hands", "Fooling Yourself (The Angry Young Man)", "Renegade" and more. It also includes a special surprise visit from Don Felder — formerly of THE EAGLES — for a rousing performance of "Blue Collar Man (Long Nights)". It was released on CD July 24, 2015. After 14 years, STYX's sonically sweet 16th studio album and its most ambitious, most challenging, and most rewarding album to date, "The Mission", was finally released June 16, 2017 on the band's label, Alpha Dog 2T/UMe. Tesla: Over the course of their 35-year career, the iconic Sacramento melodic hard rock quintet—Frank Hannon (guitar), Brian Wheat (bass), Jeff Keith (lead vocals), Troy Luccketta (drums) and Dave Rude (guitar)—sold more than 25 million albums domestically and played globally to sold-out crowds far and wide. To say Tesla live is absolutely bombastic is an understatement, they are a hard rock band to beat all hard rock bands. Tesla’s ninth full-length album titled Shock is due out fall of 2018. The highly anticipated album features Phil Collen of Def Leppard in the producer’s chair and takes a big leap forward as they glance back on their Mechanical Resonance Live! album.